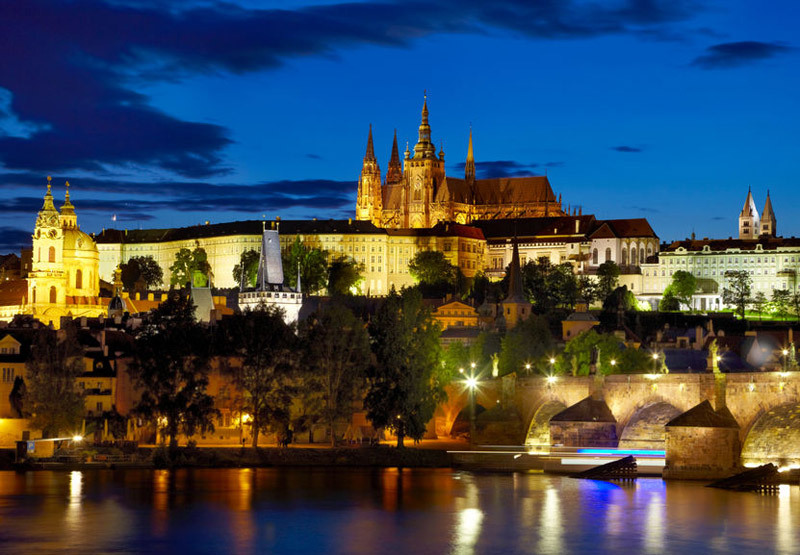 Prague Castle, definitely one of the most significant and interesting sights of the Czech Republic´s capital, is unmistakable and highly visible, resting on a hill above the Vltava river. The largest coherent castle complex in the world, it is not only an ancient symbol of the Czech lands, but also one of the most important cultural institutions in the Czech Republic and the official residence of the President. Since the foundation of Prague Castle it has been developing uninterrupted throughout the past eleven centuries. This wondrous castle complex has been the most significant national, cultural, and historical monument for Czechs, and remains a symbol of the development of the Czech state lasting for more than thousand years. Located in the Castle District Hradčany, Prague Castle was founded in the 9th century by Prince Bořivoj, the first historically documented member of the Premyslid Dynasty. He transferred his original seat from Levý Hradec (north of Prague) to the hill above the Vltava river. The first princely palace was most probably built out of wood. 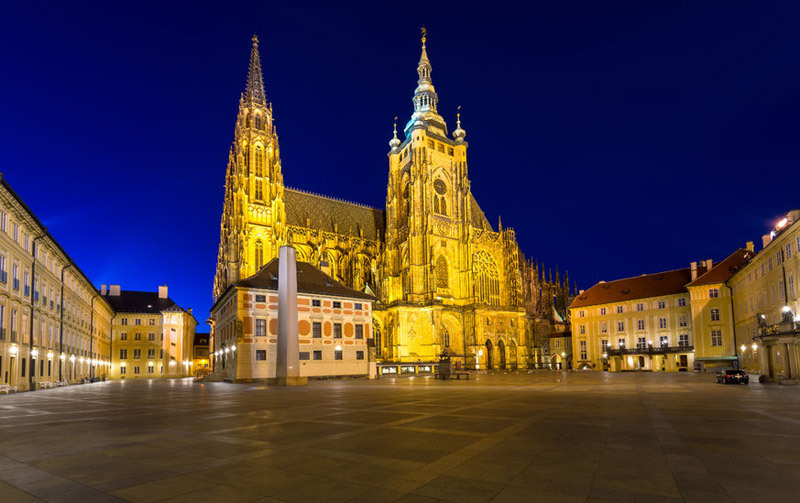 The famous history of Prague Castle begins with the first stone building – the Church of the Virgin Mary, although only remnants of this can still be seen today. The second church within the Castle complex was the St. George Basilica, established by Prince Vratislav I. Prince Václav (the future famous Czech saint) had the third sanctuary built there in the 920s. The St. Vít Rotund was later (in the 11th century) rebuilt by prince Spytihněv II to a mighty basilica. At the end of the 10th century the significance of Prague Castle grew again, as it became not only the domicile of the head of the state, but also the seat of the Prague Bishop. The first Bohemian monastery was founded by the St. George Basilica at the same time. At that time the Castle took up about six hectares. The former settlement was then rebuilt into a strong medieval castle in the Romantic era and kept growing. The appearance of Prague Castle was very markedly affected by the Gothic era, and many changes took place during the significant era of Charles IV (King of Bohemia and Holy Roman Emperor), during whose reign the Castle became an imperial residence for the first time. The celebrated ruler, had among other things, the Prague Castle fortifications strengthened and covered some of the roofs with gold-plated metal sheets (that is why Prague is often called “Gold”). During the Renaissance era many generous constructional modifications came through, once again adding to the uniqueness of Prague Castle. In 1541 a fire greatly damaged some objects in the castle complex, but restorations were made very fast, in a way paradoxically leaving the Castle even more exquisite in the end. During the reign of the emperor Rudolf II, Prague Castle became for the second time the centre of European culture and science. Rudolf, among other things, had new premises for his famous collections built. Also, construction began on the famous Golden Lane during his reign. Once again the castle was severely damaged in 1631, when it was seized and plundered by the Saxon army, and again by the Swedes in 1648. Extensive reconstruction followed, during the Maria Theresa era in the 18th century. She finally had Prague Castle turned into a highly representative castle complex. Several objects were also modified in relation to the stay of Ferdinand I the Good, after his abdication in 1848 and the promised coronation of Franz Joseph I in the 1860s. After the fall of the Austro-Hungarian Empire in 1918, Prague Castle welcomed the first president of independent Czechoslovakia – Tomáš Garrigue Masaryk. And since the beginning of the 20th century, much attention was paid to archaeological research, which has brought about many findings about the Castle’s history. Research and restoration of the individual premises and objects after 1990 has been guided by the idea of revival via the greatest possible opening for the public. After the Velvet revolution (the non-violent transition of power from Communist rule to democracy in what was then Czechoslovakia), many areas of the Castle were made accessible to the public for the first time in history, including the Royal Garden, Ballgame Hall, the south gardens, and the Imperial Stables. Today, after many hundreds of years of fascinating history, Prague Castle is the seat of the Czech president, the most important National Cultural Monument of the Czech Republic, a place of storage for many priceless art relics and historical documents, and last but not least an eminently popular target for millions of tourists from all over the world. Prague Castle is easily accessible by public transport. There are several tram stops nearby (Královský letohrádek, Pražský hrad, and Pohořelec) and also two metro stations (Malostranská and Hradčanská). Usually visitors take tram No. 22 to Pražský hrad tram stop and leave down the Old Castle Stairs to Malostranská metro station. In the Summer Tourist Season (April – October) the Prague Castle complex is open to the public from 6 am to 10 pm and the historical buildings from 9 am to 5 pm. During the Winter Season (November – March) the opening hours are the same for the Prague Castle complex, but the historical buildings close an hour sooner. You can purchase tickets online or directly on the spot. We definitely recommend visiting the complex in the evening after sunset, when the views are truly magical and unforgettable. On the official Prague castle website you can also take a nice virtual tour of the whole complex, including the whole of the building below. Go to https://www.hrad.cz/en/prague-castle-for-visitors/virtual-tour to enjoy the tour from your home. The magnificent Prague Castle, located in the Castle District Hradčany, is the largest coherent castle complex in the world, and for the Czechs it has a huge historical, symbolic and cultural meaning, constantly growing since the current seat of the Czech President´s foundation in the 9th century. Beneath Prague Castle, beautiful, terraced gardens offer refuge and tranquility. 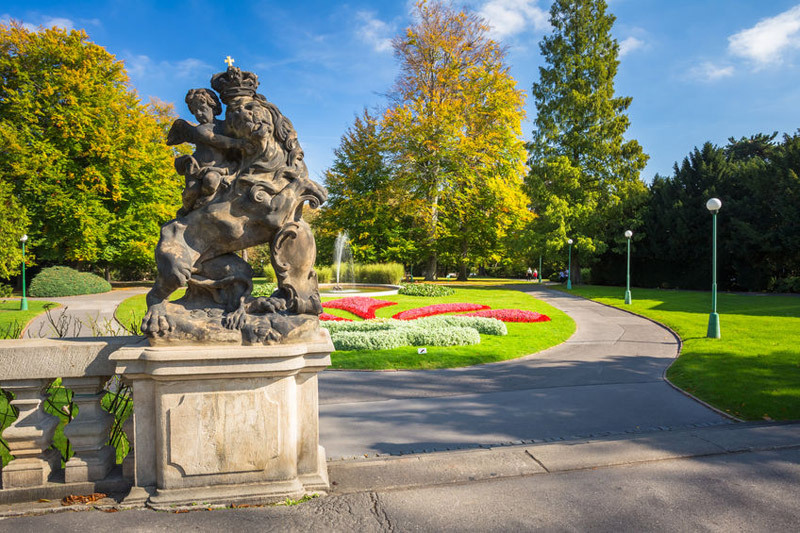 Created for the owners of the adjoining palaces, they are today one of the few quiet places in the centre of Prague. The original residence building was built mostly of wood in the 9th century and its exact location is not documented. In the 12th century prince Soběslav had a stone Romanesque palace built right next to a new fortification wall, and remains of it have been preserved underground until the present day. The original royal palace was adjoined on its eastern side by All Saints’ Chapel, which was consecrated in 1185. On the site of the Romanesque palace chapel the All Saints’ Church was built by Petr Parler in the 14th century, and was magnificently decorated in the manner of Sainte Chapelle in Paris. Unfortunately, only its peripheral walls remained after the great fire of 1541. All Saints’s Church is open to the public only when religious services take place in it. The Teresian Wing originated during the course of the reconstruction of the Castle in the 18th century, being adapted for exhibitions of creative art in 1993. The magnificent solemn room Vladislav Hall was added in the 15th century, nowadays being used for large public events of the Bohemian monarchy and the modern Czech state. The largest temple in Prague is the place where the coronations of Czech kings and queens took place. It is also, of course, of huge religious importance, being among other things the burial place of several patron saints and archbishops. The second church built in the Prague Castle complex is unfortunately not completely preserved today, but one can still see the parts of the building that were founded in 920 by Prince Vratislav I. In 973, when the convent of Benedictine nuns was founded, the church was enlarged and reconstructed. The current appearance of St. George’s Basilica is Romanesque, with a main apse and two steeples. The interior is austere and monumental. In the main nave the tombs of the members of the ruling Premyslid Dynasty are situated, one of them belonging to prince Vratislav, father of St. Wenceslas. The permanent exhibition in The Picture Gallery at Prague Castle is a showcase of collections of European paintings from the 15th to 18th century. The oldest Picture Gallery in the Czech lands, it displays among others several works from famous Rudolfine collections. Apart from the permanent exhibition there are many cultural events that regularly take place in The Picture Gallery. The originally Renaissance palace was built by the Rosenberg family in the 16th century and became the property of the emperor Rudolf II in 1600. It remained in its original form until the 18th century, when it was radically rebuilt to house the Institute of Noblewomen (a home for aristocratic ladies fallen on hard times, founded by Empress Maria Theresa in 1755). Between years 1996 and 2007, the Rosenberg Palace was renovated to a Baroque look. Nowadays, part of it houses an exhibition about the life of the Institute of Noblewomen. 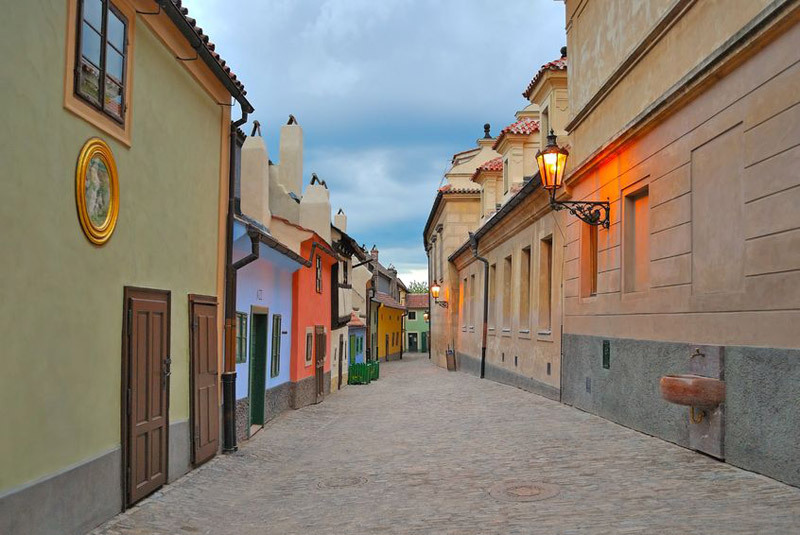 Golden Lane, an ancient street within the Prague Castle complex, dates from the 15th century. It consists of charming, small, coloured houses. Many famous personalities stayed there in the past, for example Franz Kafka and Jaroslav Seifert, winner of the Nobel Prize for Literature. According to legends it was also connected to alchemists, searching among other things for ways to manufacture gold (hence the name). Nowadays it is mainly occupied by galleries and gift shops and is very popular among tourists, especially for its colourful, almost fairy-tale-esque look and absolutely unique atmosphere, echoing long gone eras. Lobkowicz Palace, the only privately owned building in the Prague Castle complex, is among other things home to the highly acclaimed Lobkowicz Collections and Museum.